Nā Gareth Seymour ēnei tuhinga. 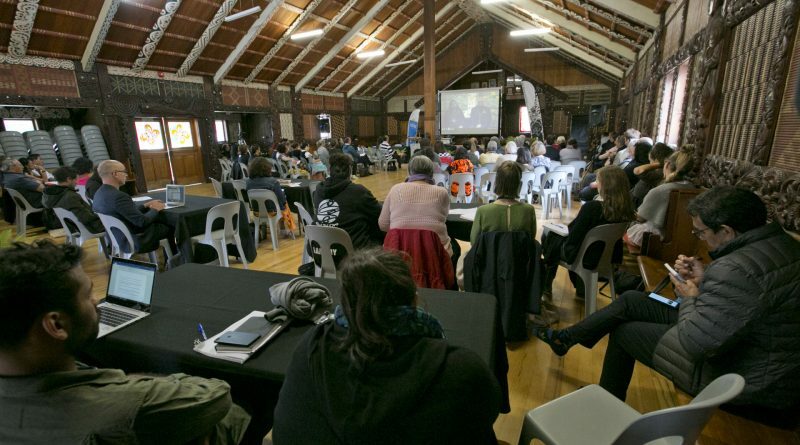 The 2019 Tūhonohono conference was on 28 and 29 March and focused on Te Hau-ki-Tūranga, a whare from Rongowhakaata that currently resides at Te Papa. Staff from iwi, museums, archives and libraries travelled to the hui at Te Poho-o-Rāwiri marae in Tūranga, Gisborne, to discuss all sorts of kaitiaki (kaitieki) issues. The hosts were Rongowhakaata iwi and Te Papa, and manuwhiri were looked after from beginning to the end. 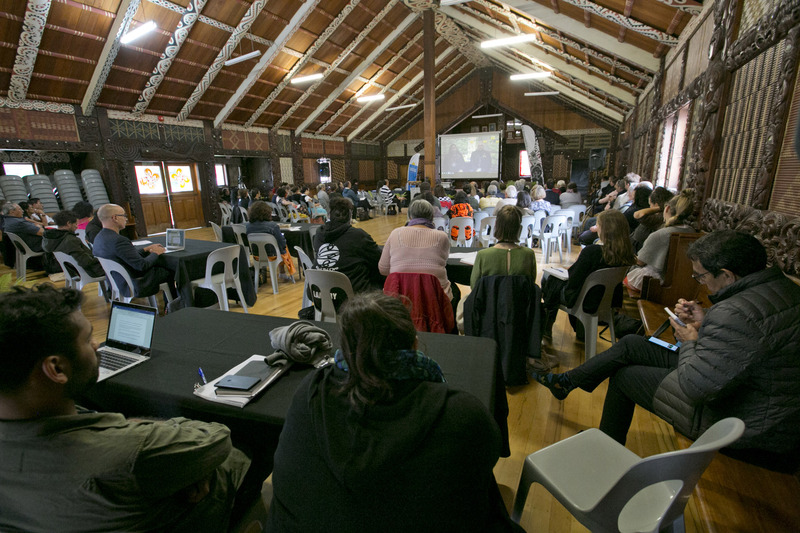 On the weekend following the hui, small workshops were held at Whakatō marae to discuss storage and preservation of taonga. For the out-of-towners it was an excuse to don some gumboots and to wānanga with the whānau about how to store a piupiu or to hang a kete, for example. The pōhiri at Te Poho-o-Rāwiri. Courtesy Te Papa. From the pōwhiri on day one through to the poroporoaki (farewell) on day two, there was no shortage of food for thought presented by speakers. Te Papa staff and even the local mayor fielded questions about the location and care of taonga, such as Te Hau-ki-Tūranga. Gisborne’s Meng Foon is unique as a Māori-speaking mayor. As he was present at the hui, he could answer questions kanohi ki te kanohi about local water supplies, flooding risks and other issues that were raised spontaneously from the floor. This is direct engagement, East Coast style. Tūhonohono presentation. Courtesy Te Papa. 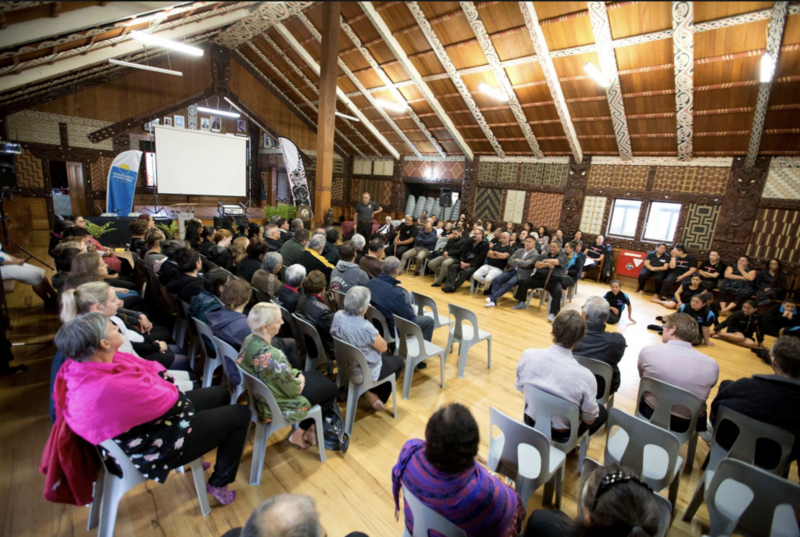 I appreciated the discussion on the pros and cons of returning the whare to Tūranga in an open forum – lots of ideas to chew over as I reflected on how my own iwi might manage the return of such a taonga to our own rohe. The panel discussed the resources required, whether there were benefits of leaving it at Te Papa in Pōneke, and cultural challenges. 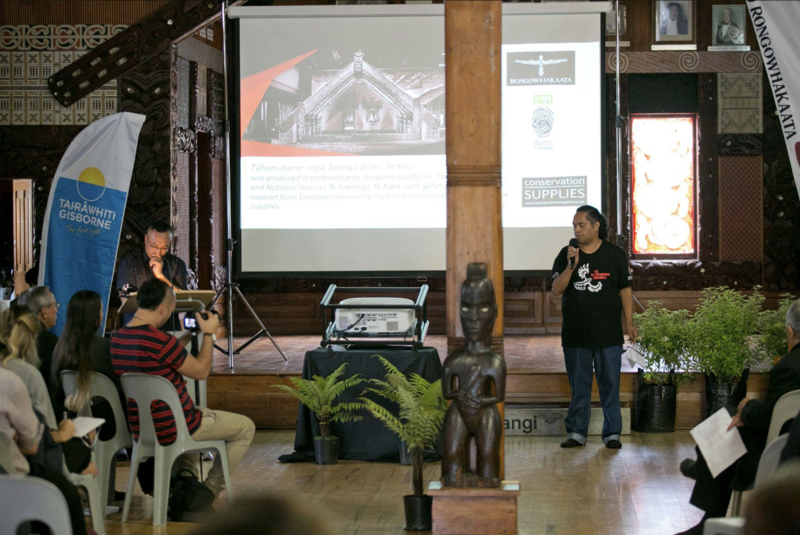 Te Hau-ki-Tūranga was confiscated in 1867, and Rongowhakaata presented their history back to the waka and how the loss of the whare represented so many other losses to the iwi through colonisation. In many ways, its current position away from the whenua is a metaphor for how to grow the wellbeing of the people. Teina Moetara presents the history of Rongowhakaata. Courtesy Te Papa. Jody Wyllie of Rongowhakaata has compared the whare to an encyclopedia – albeit an encyclopedia that he says has had “its spine torn out” and with its pages out of order. As we sat in Te Poho-o-Rāwiri, another whare resplendent with whakairo, tukutuku and kōwhaiwhai, the hui touched several times on how our whare are our own museums and libraries and how they embody our collective whakapapa. 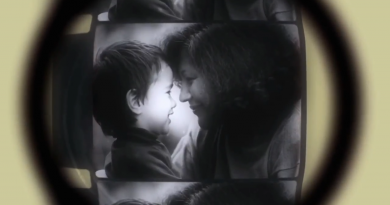 Ngā Taonga Sound & Vision made a small contribution by presenting Te Ohaki o te Po (From Where The Spirit Calls) a short documentary from 1978 detailing the restoration of local whare including Rukupō at Manutuke. One nanny at the hui saw herself and her tamariki in the footage and shared with us the names of the kaumātua on the paepae back in 1978. This is valuable information for us to add to our records. Thanks again to Te Papa, Rongowhakaata and all of Tūranga for their manaakitanga. If the kaupapa for Tūhonohono is ‘for iwi to share the kaupapa of kaitiekitanga,’ this occurred in spades in Tūranga and Ngā Taonga looks forward to attending and supporting the next Tūhonohono hui in a year or two.